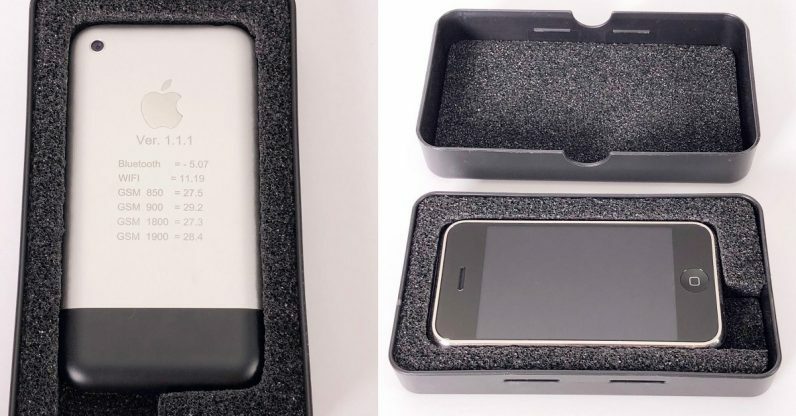 A seller on eBay claims to be offering a piece of Apple history — a functional iPhone prototype circa 2006. Over 100 bids have been logged on the listing, and the price is now reaching into the high five figures. The seller, one “321dady,” calls the device the “rarest of them all.” The etching on the back proclaims it to be Version 1.1.1, and according to 321dady, it was made in 2006 in Cupertino. It has a different battery and hardware than the release version, and is slightly heavier at 144 grams. Pictures of the phone in the listing show it running a very different OS from the one we’re used to, but the app tiles don’t look too different from what we have now — I was tickled to see the tile that lets you view the phone’s serial number looks like a box of Cheerios. There’s always a chance it’s not the real McCoy — the description even warns buyers to beware of phonies. But some of the details call to mind the original scuttlebutt around the iPhone. For example, in his announcement, Steve Jobs said the iPhone would run OS X (the final product didn’t, it turns out), and the seller of this phone claims it runs OS X. Regardless, the bidders seem to think it’s real. Yesterday, the bid was sitting around $1000, while it’s over $25,000 at time of this writing and steadily rising. And the device could potentially go for a lot more: The seller claims the phone was listed in 2015 and the highest bid was around $61,000. It’s not the first time we’ve seen iPhone prototypes pop up, obviously. Last year, a collector activated two chunky, early model iPhones running an OS called Acorn, supposedly a forerunner of the iOS we eventually got. Sonny Dickson also showed off similar devices. It’s a fascinating look at the product development cycle, though I’m not sure I’d be willing to pay the equivalent of a college tuition for the privilege of holding it. If you have tens of thousands of dollars lying around and want to try your luck, the listing is set to be active for another week.